This past holiday season marked the first year that holiday shoppers spent more of their gift budgets online than in stores, according to a recent report by the consulting firm Deloitte. Environmentalists are indeed concerned that this trend doesn't augur well for the environment, given the extra packaging waste and energy costs that accompany getting merchandise to customers. Going to the store or mall to do our shopping burns fossil fuels, for sure, but at least the items we purchase don't then have to be re-swaddled in extra filler and cardboard and shipped to us on a plane, truck, train or ship. For its part, Amazon--the company many blame for ushering in the transition to e-commerce in the first place and which today dominates online retail--used some 6,000 trucks and 32 planes to get some five billion items to its Prime members in 2017. During that process, untold hundreds of millions of cardboard boxes were used to get customers' choices to their doorsteps. Those boxes are in turn typically recycled by the recipients, and collected by municipal curbside pick-up service. But that's not the end of the story: Next, this once-used cardboard is typically shipped to China where it is soaked in water, stripped of staples and reborn as new cardboard. In many cases the box you recycle has made a 12,000-mile, fossil-fuel-spewing loop at sea in its journey of rebirth. So... while recycling is a great thing, it may not be worth it if we factor in the fossil fuels emitted in the process. We'd be better off avoiding the extra layer of packaging altogether. Maybe that trip to the mall isn't such a bad idea after all. That said, Amazon recently boasted of transitioning to more sustainable packaging during the 2017 holiday season, switching 100 million shipments from cardboard boxes to less resource-intensive padded mailers, reportedly eliminating 181,000 tons of waste. So that's something, but Amazon and other online retailers have a long way to go in reducing not only the amount of packaging but perhaps even the packaging altogether when possible. This is not to say you should feel bad about recycling your boxes in the wake of the holidays, as it's a perfectly decent environmental thing to do. But if you want to go the extra mile, maybe think of some way to reuse them at least one more time before the next recipient ships it off for recycling--or re-uses it as well. Also, don't forget that most gift wrap--as long as it doesn't have foil or glitter or a plasticizing non-rip coating--as well as holiday cards, can be recycled as well. And yet another option for responsibly discarding that cardboard, wrapping paper and holiday cards is in your yard waste or compost bin, in which case it will live another day not as a cardboard box but instead as part of your next batch of mulch or soil amendment. 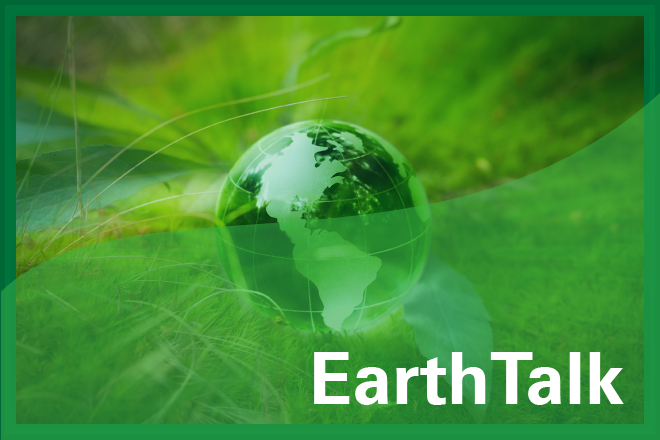 EarthTalk(r) is produced by Roddy Scheer & Doug Moss and is a registered trademark of the nonprofit EarthTalk. To donate, visit www.earthtalk.org. Send questions to: question@earthtalk.org. 27 simple ideas to increase your physical activity – and your health!